On this page you will find the economic conditions and the documents required to rent an apartment to 3 until 11 months. Important: is not required to pay the full amount to reserve an apartment. See details on how to book an apartment. Whatever the duration of the lease, 3 to 11 months, the deposit to pay for a fully furnished apartment is two months rent. 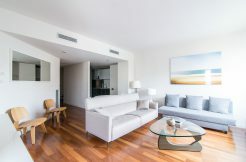 This is the minimum set by Spanish law for a fully furnished apartment. As mentioned above, the deposit must be paid on the day of signing contract and delivery keys. At the end of the contract, if the apartment is in the same conditions as when you entered, the deposit will back by bank transfer to a single bank account facilitated by the tenants. Utilities (water, electricity and gas) are not included in the rental price. Each month, in addition to rent, tenants must pay a provision that is a normal load forecast consumption, it depends on the number of tenant ( see below). Be indicated on the lease the actual reading of each meter at the beginning and the end of the lease in order to calculate the actual consumption of tenants. They will be reimbursed if the difference (provision of real-load consumption) is positive or will be deduced from the deposit if it is negative. National identity card or passport. If student: certificate from the school / university. If employee: last 2 payslips. Owner: How to arrange your apartment to promote its rental? Why embark on temporary leasing?